Dr. Palak Sheth is Director (Planning & Development) in President’s Office at Pandit Deendayal Petroleum University (PDPU), the University established through Gujarat State Legislative Act in 2007. He assists President and Provost in the matter of Strategic Planning and Development, Research and Internationalization. He has played vital role in establishing collaboration with University of Tulsa, University of Oklahoma, University of Houston and Georgia Institute of Technology in USA; University of Regina and University of Saskatchewan in Canada; University of Wollongong, and Kangan Institute, Melbourne, Australia; respectively for PDPU from 2007 to 2014. Prior to this, he played a vital role in conceptualizing and establishing Pandit Deendayal Petroleum University (PDPU) from scratch from 2003-2007. He has been instrumental in conceiving and establishing School of Petroleum Management, School of Petroleum Technology, School of Solar Energy, School of Liberal Studies and School of Technology at PDPU. He was actively involved in establishing Gujarat Power Energy and Research Institute- Degree Engineering College at Mehsana in 2010. In addition to his role at University, Dr. Sheth assisted Principal Secretary, Energy & Petrochemicals Department, Government of Gujarat for development of 650 MW Solar Power Projects and Asia’s biggest Solar Park in Gujarat from 2009-2012. He was Project Manager assisting Managing Director, Gujarat State Petroleum Corporation - the State Oil Company from 2001-2010 in Project execution in the area for Exploration, Production, Gas Pipeline, Power Project, IT and Education. He holds MBA and B. Tech. (Chemical Engineering) degree from renowned Institutes in Gujarat, India. 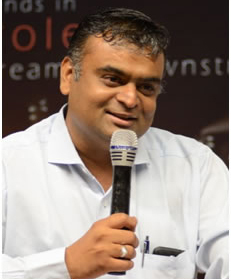 He has completed his Ph.D. in Management from Dharmsinh Desai University, Gujarat. His interest areas are Institutional tie-ups, Research and Internationalization of Higher Education for Pandit Deendayal Petroleum University.